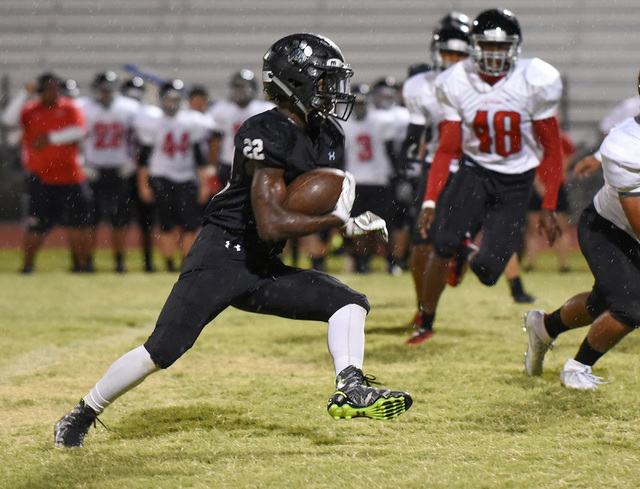 Elijah Hicks didn’t seem to mind the slippery conditions, as he scored three touchdowns to help Las Vegas regain control en route to a 28-7 road victory in both teams’ season opener. 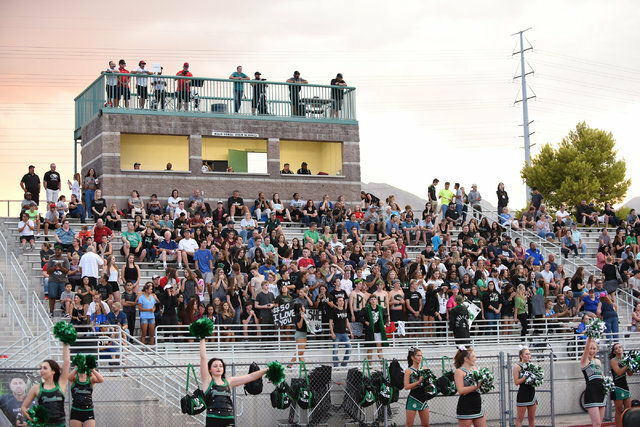 Momentum appeared to be turning Palo Verde’s way Friday when the first raindrops began to fall. Lightning caused a 35-minute rain delay shortly thereafter, and the Panthers were never the same. The delay came late in the second half, shortly after Hicks had given Las Vegas (1-0) a 7-0 lead with a 3-yard TD plunge up the middle. 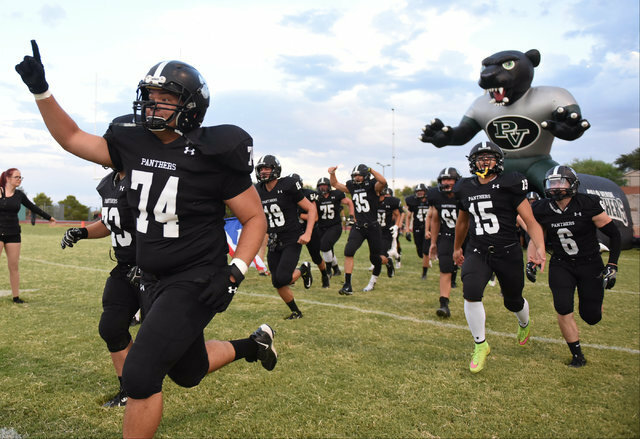 Palo Verde (0-1) used a 50-yard drive to advance the ball to the Wildcats’ 18. But with 27 seconds left in the half, players were removed from the field because of heavy rain and nearby lightning. When they returned, Panthers’ quarterback Jonathan Schofield immediately threw an interception to end the threat. Timely defensive plays were a key for Las Vegas, which held the Panthers to 61 offensive yards in the first half. 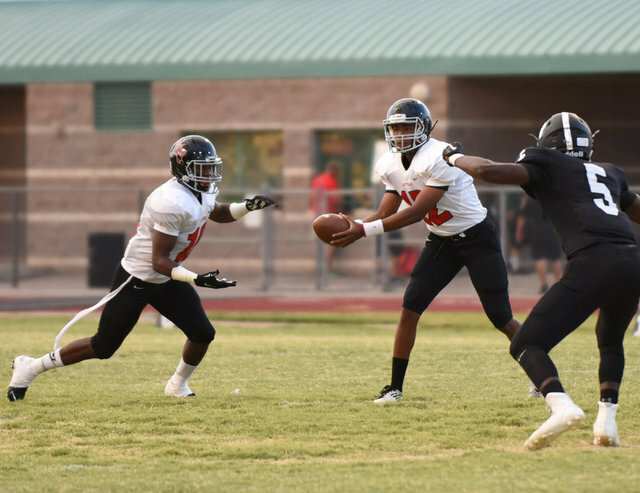 Palo Verde did mount one strong drive late in the third quarter, using a 31-yard run by Terrill Jimerson to set up a 56-yard scoring sprint by Chamere Thomas. That tied the score at 7. But any momentum gained was erased moments later when Hicks returned the ensuing kick 87 yards to help Las Vegas regain the lead at 14-7. After a 17-yard TD pass from Ronnie Broadhead to Nick Sablan, Hicks got the ball again, putting the game away late in the fourth with an 11-yard run capped by a desperation dive into the end zone. Hicks finished with 28 yards on 11 carries, while teammate DiQuan Brown rushed three times for 57 yards. Thomas carried 16 times for 106 yards to lead the Panthers. 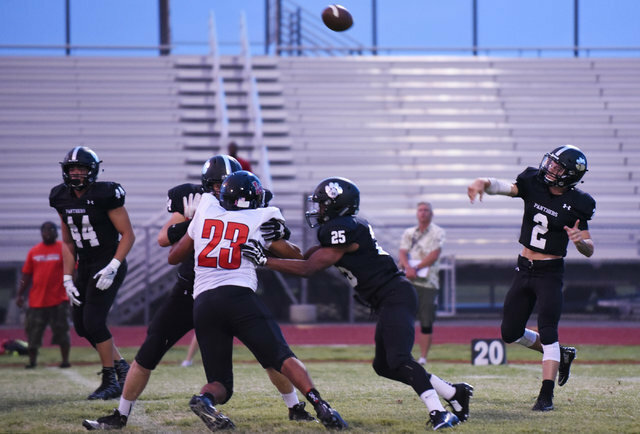 Sunrise Mountain 39, Boulder City 6 — At Boulder City, Stephen Wright completed 21 of 25 passes for 454 yards and four touchdowns as the Miners (1-0) routed the Eagles. Te’andre Love opened the night’s scoring with a 60-yard touchdown catch and run with 4:04 left in the first quarter. Despite only three catches, Love had 123 yards receiving. 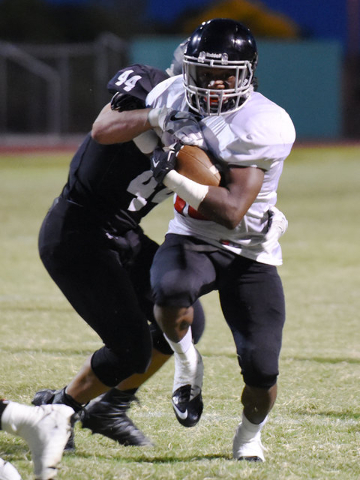 Tyree Hayes also benefited from Wright’s big night, catching touchdown passes of 17 and 5 yards. Hayes had five catches for 91 yards. Xavier Kyles got in the mix, catching a 48-yard touchdown with 6:54 left before the half. Kyles caught five passes for 58 yards and carried the ball 10 times for 51 yards. The Miners’ ground game was not nearly as effective. Claude Moore carried the ball five times for 90 yards, but 77 of those yards came on a touchdown scamper with 1:43 remaining in the third quarter. The lone bright spot for Boulder City (0-1)came on the ensuing kickoff, when Zach Trone ran the ball back 80 yards to the end zone. Trone, also had three catches for 22 yards. Boulder City quarterback, Taylor Hatchel, struggled to find a rythm all night. The was 9-for-18 passing for 56 yards. 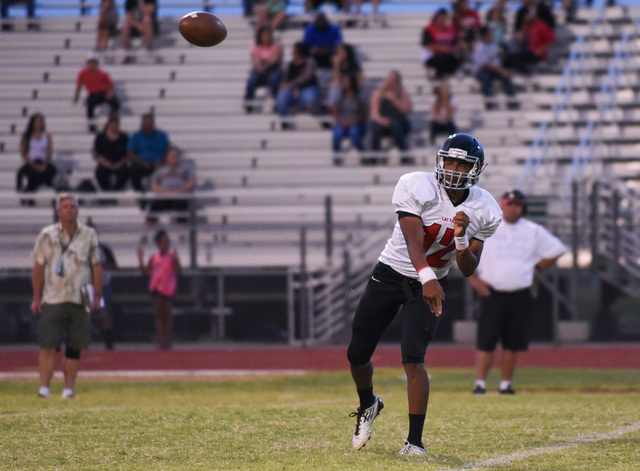 Chaparral 44, Bonanza 22 — At Chaparral, quarterback Santiago Vialpando completed 16 of 25 passes for 273 yards, including two touchdowns to Devin Gaddy, to power the Cowboys past the Bengals. Vialpando found Gaddy on the game’s first play from scrimmage for a 54-yard TD strike down the right sideline. The Cowboys (1-0) led 8-0 after Jacob Ford’s 2-point conversion run. Bonanza answered on its ensuing drive with a 55-yard run by Ricardo Hill, and added a 2-point run by Ammon Montenegro to tie it at 8-8 early in the first quarter. Ford supplied a 3-yard TD plunge, and Vialpando connected with Kentrell Petite on a slant over the middle for a 35-yard TD to put the Cowboys up 22-8 at the end of the first quarter. Bonanaza quarterback Cannon Reid tossed a 6-yard TD pass to R.J. McCarter to cut the lead to 22-14 with 6:33 left in the second quarter. Chaparral’s TyRay Collins scooped a fumble four minutes later and raced for a 77-yard score to put the Cowboys up 28-14 at the half. Vialpando hit Gaddy for a 12-yard score, and Ford added a 1-yard TD run to put the game away in the second half for Chaparral. Del Sol 24, Western 12 — At Del Sol, Taariq Flowers rushed for three touchdowns, finishng with 121 yards on 26 carries, to lead the Dragons over the Warriors. Western opened the season with a 67-yard drive capped by a 3-yard touchdown run by Rodger Harrison. Harrison would finish with a game-high 218 yards on 32 carries. The Warriors’ lead would be short lived as the Dragons (1-0) wasted no time turning two first quarter fumble recoveries into points. Miguel Gomez recovered the first of three Warrior fumbles on the Western 10-yard line, setting up Flowers first TD run just two plays later. Ati Poni recovered a Western fumble deep inside Warrior territory on the following drive, leading to Flowers’ second score. Titan Williams added a 7-yard run in the second quarter to give the Dragons an 18-6 lead at the half. Harrison was difficult to bring down throughout the game and closed the gap to six with a 56-yard touchdown run with 41 seconds left in the third quarter. The Warriors (0-1) would draw no closer, and Flowers would put the game out of reach with his final TD, a 12-yard scamper with 3:21 to play. Del Sol junior Jason Hoyer finished with 70 yards on nine carries and intercepted a pass. Pahrump Valley 38, Eldorado 10 — At Pahrump, Nico Velazquez scored on a 99-yard kickoff return and a 49-yard TD pass from Parker Hart as the Trojans cruised past the Sundevils. Senior linebacker Daniel Kinkade scored on a punt that was blocked by teammate Jesse Dillon, and Case Murphy added two rushing TDs for the Trojans, who led 21-0 after the first quarter and 35-3 at halftime. Murphy finished with 38 yards on five carries, and Aaron Fuentes had 101 yards rushing on eight carries for Pahrump (1-0). Jaime Rangel completed 16 of 29 passes for 174 yards and added 10 carries for 49 yards and a TD to lead Eldorado (0-1). 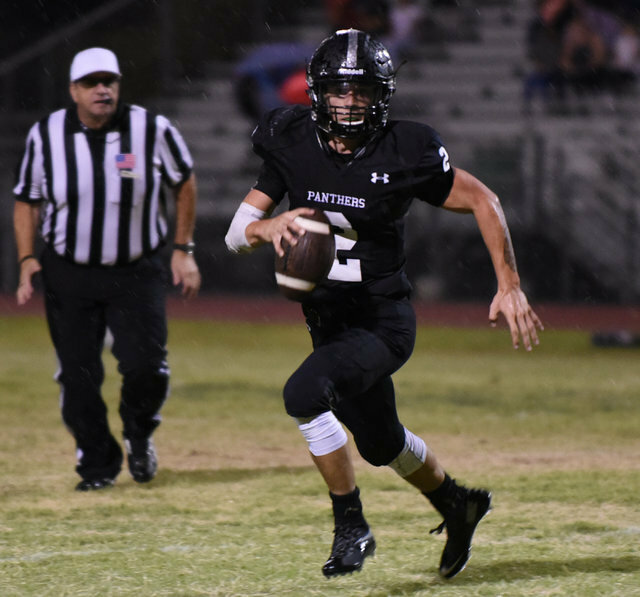 St. Pius X (Texas) 42, Faith Lutheran 10 — At Faith Lutheran, Parker Gunnell passed for 377 yards and three touchdowns and ran for a score as the Panthers routed the Crusaders. Faith Lutheran starting quarterback Christian Marshall completed 9 of 11 passes in the first half, but didn’t return for the second. Despite that, and the fact that the Panthers left their starters in until the final buzzer, the Crusaders played the second half to a 7-7 draw. Sagan Gronauer subbed at quarterback and hit Michael Peck for a 20-yard TD pass in the second half for Faith Lutheran. 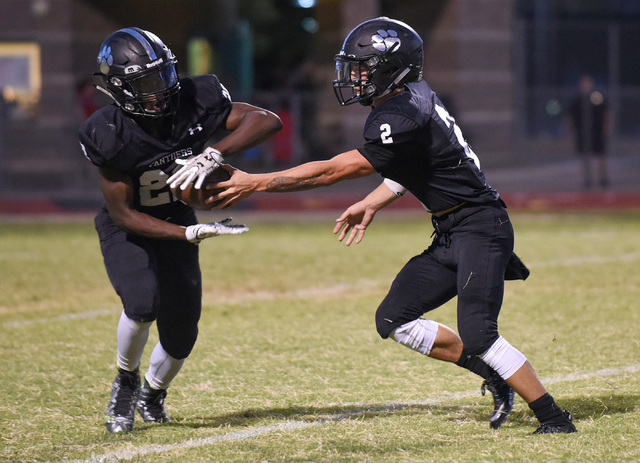 Saundre Spiller had 15 carries for 105 yards to lead Faith Lutheran’s ground game, and Elijah Kothe had four catches for 84 yards for the Crusadres. Gunnel hit eight different receivers for the Panthers, who got five receptions and 151 yards from Foster McLaurin. Lake Mead 21, White Pine 8 — Jared Regan rushed for 179 yards and two touchdowns to carry the Eagles to victory over the Bobcats. Both teams were scoreless in the first half, though White Pine had two red zone oportunities halted after missing fourth down conversion attempts. In the second half, however, Regan took the fourth play from scrimmage 56 yards to open the scoring. The Bobcats (0-1) attempted to answer later in the quarter, but an eight play drive was halted by the Eagles defense just outside the 20. The Lake Mead offense took the cue to score, taking back-to-back plays 70 yards in the first two plays of the fourth quarter, a 35 yard Mitch Dolinar catch and run followed by Regan’s second rushing TD, this time from 35 yards. The Bobcats struck back on the ensuing drive, as Dekoda Barela rushed for a 33-yard score, which was followed by a two-point conversion to close the gap to 13-7. The Eagles (1-0) responded, however, with Logan Sullivan finishing a clutch drive with a 15-yard rush for the final margin. Berkley completed 10 of 25 passes for 124 yards and ran for 89 yards on 21 carries for the Mustangs, who led 34-0 at halftime. Berkley scored the game’s first two touchdowns — finding the end zone on runs of 11 and 19 yards — to put the Mustangs (1-0) up 13-0 in the first quarter. 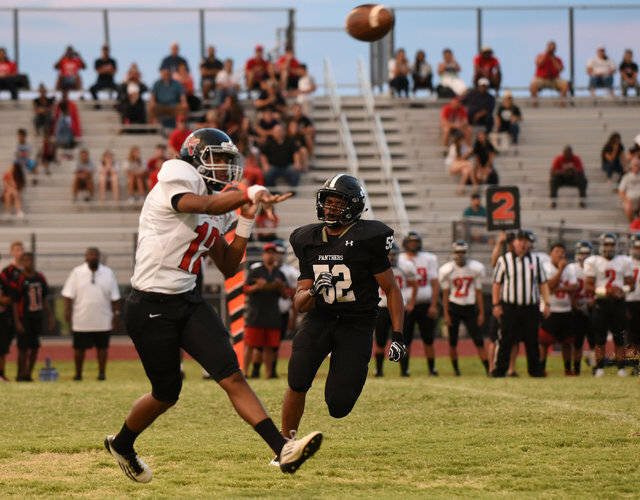 Adam Martinez had a 61-yard punt return and a 10-yard TD reception, and teammate Antonio Gutierrez caught a 17-yard TD pass and scored on a 43-yard run for The Meadows. Tonopah 68, Mineral County 22 — At Tonopah, the Muckers fell behind early, but scored 46 second-half points to top the Serpents. Tonopah fell behind early, but came back to rout Mineral County (0-1) at home Friday night, riding 46 second-half points to a 68-22 victory. The star of the night was running back Vinny Bagaros of Tonopah (1-0), who rushed for 142 yards on just 11 carries for three touchdowns. His touchdown total was matched by Kade Bunker, who went for 80 yards on 10 carries. Quarterback Tanner Otteson was 13-for-19 passing for 147 yards and two touchdowns, both of which went to Tyler Kirkland. He added 99 yards on the ground with 10 carries. Otteson also had 13 tackles and a sack on defense, outdone only by Brendan Eason, who made 16 tackles and three sacks. Mountain Crest (Utah) 36, Spring Valley 6 — At Orem, Utah, the Mustangs opened up a 15-0 halftime lead and rolled past the Grizzlies. Spring Valley’s K.C. Moore connected with Marquelle Diggs for a 25-yard touchdown pass in the third quarter. Mountain Crest added two more touchdowns in the third quarter, and another in the fourth to put the game away.